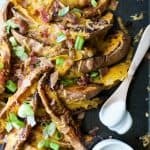 Baked Loaded Sweet Potato Wedges | Game Day Food At Its Best!Baked Loaded Sweet Potato Wedges | Game Day Food At Its Best! LOADED SWEET POTATO WEDGES, baked until crispy then covered with gooey cheese, crispy bacon and scallions. Appetizer. Side Dish. Main Dish. You decide! To a large bowl, add sweet potato wedges. Drizzle with olive oil. To a small bowl, add sea salt, garlic powder and ancho chili powder. Add spice mixture to sweet potato bowl. Toss sweet potatoes to coat with olive oil and spices. Place sweet potatoes skin side down on prepared baking sheet. Bake for 35-40 minutes. Remove from oven. Sprinkle with cheddar cheese and bacon. Bake for 3 more minutes, until cheese is melted.